I am a huge fried wonton fan, like huge. I could eat them all day, and honestly there was a good couple days when I was pregnant that I did. I knew I had to find a healthier but still delicious alternative. I tried baking them in the oven once but they just tasted bland. Ever since, i’ve been searching for a healthier alternative. Until now! A couple weeks ago my husband said something that made a light bulb go off and every thing came together into one cheesy, crunchy, finger food goodness. My husband was at work and there was free pizza. He exclusively eats pepperoni pizza. All they had was supreme pizza. But who can pass up free pizza? So he took a piece and picked off all of the unbearable toppings. Green peppers were one of the toppings that got a chance to stay on. He came home and told me about the pizza ordeal and that green peppers weren’t all that bad and he wouldn’t mind if we ate them occasionally. I leapt at the chance to incorporate them into a food we both love and cream cheese was the first thing that came to mind. 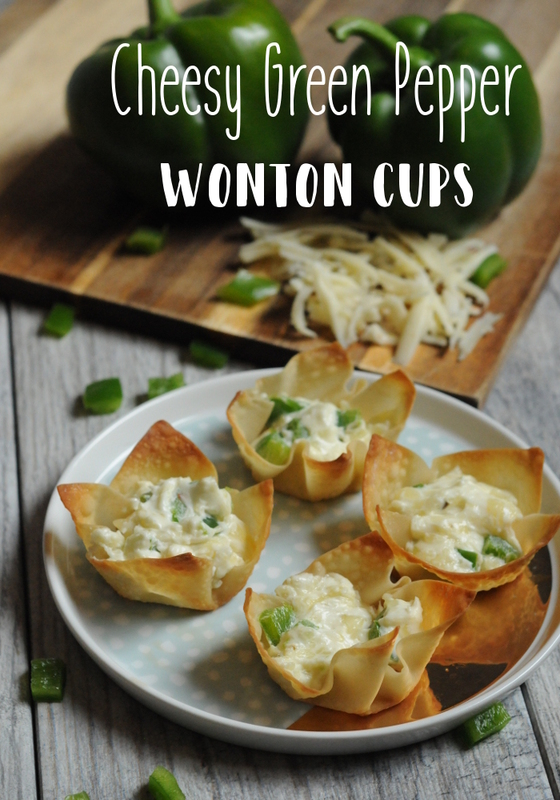 Of course cream cheese lead to wontons and that is when I realized peppers were that extra boost my baked wontons were missing. So I had green peppers, cream cheese, and wonton wrappers. I felt like more cheese was needed. 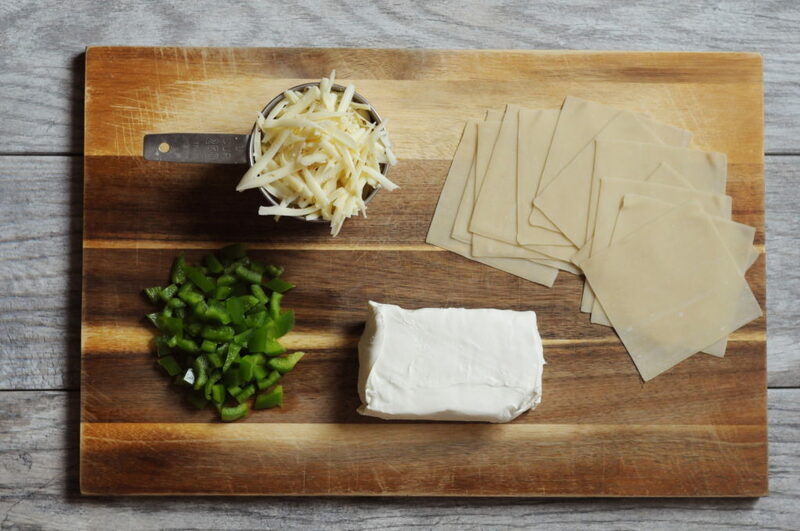 More cheese is always needed. Although you could use any cheese, I went with pepper jack to add a little extra spice to accompany the peppers. When it came to the wontons themselves, I knew they needed to have extra time to cook without any filling to get a more all around crunch. Open style wontons was the solution. 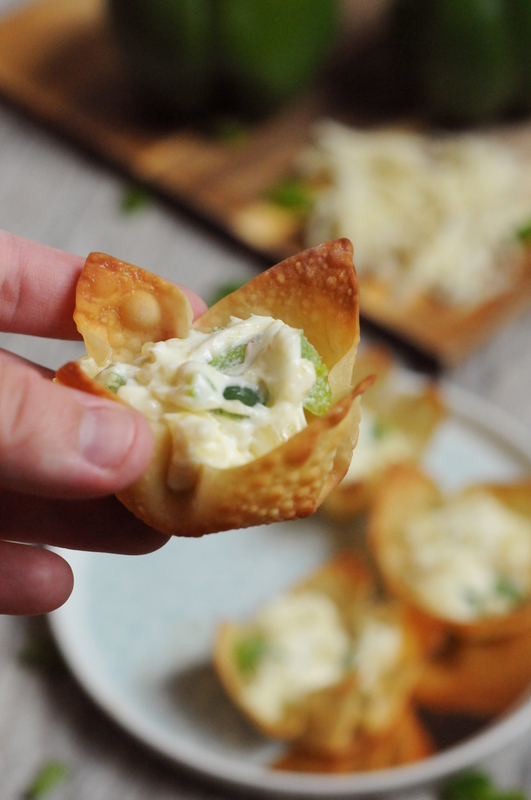 Although it’s functional, it also make for a very adorable little single serve appetizer. This recipe is so good, but just as important it’s so easy. It’s a recipe you’ll be able to whip up real quick when you’re in a pinch for a party or even just as a side dish for dinner. I love that it’s good for my picky eater husband but has enough flavor to feel like i’ve actually cooked something! Deliciously cheesy with the perfect amount of crunch. Easy to make, but looks great for parties and events. 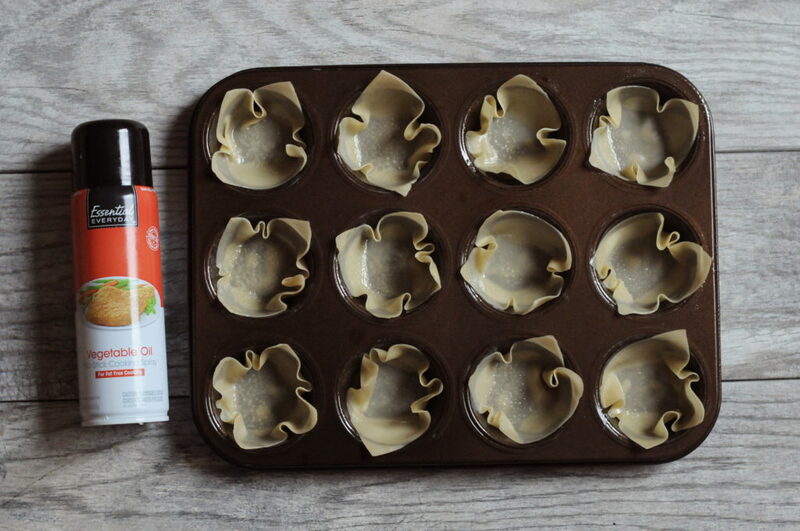 Spray each wonton wrapper on both sides and place in cupcake tin to crate a cup. Place wontons in the oven for about 8 minutes. You do not want the edges to brown, let them get a little bubbly and stiff. While wontons cook, dice ½ a green pepper and shred one cup pepper jack cheese. 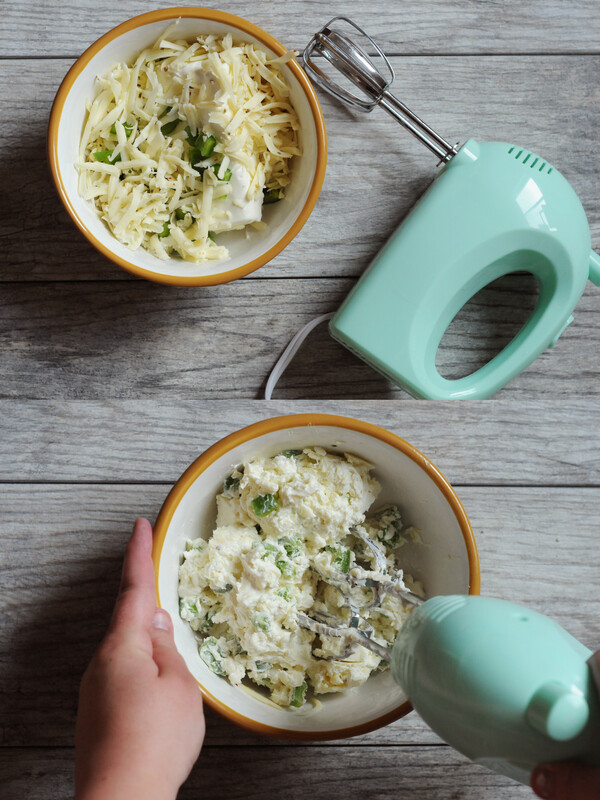 Combine pepper, cheese, and cream cheese and mix till combined. 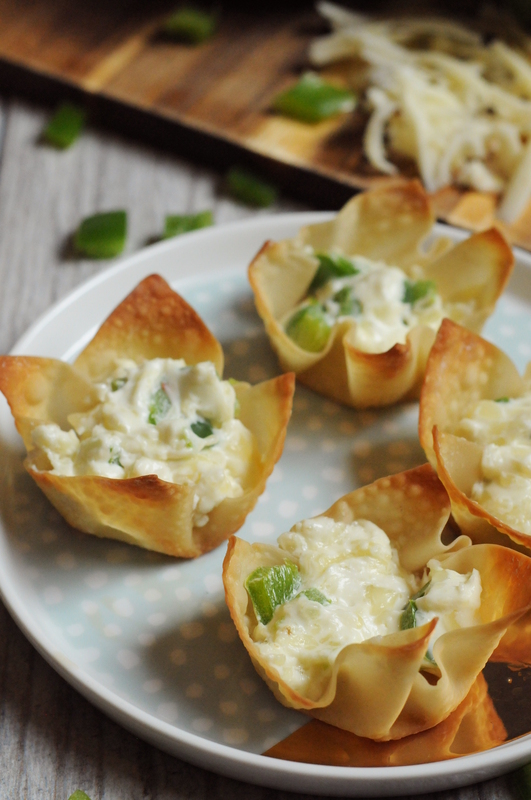 Remove wontons from oven and fill with the cheese and pepper mixture. (There will be some cheese mixture leftover.) Put them back in the oven for about 6 to 8 minutes or until wontons are lightly browned. Remove from cupcake tin and enjoy! The Ugly Truth that is DESTROYING the Family! 5 Benefits of Teaching your Child to Pray, IN ANOTHER LANGUAGE!